25th September 1915, aged 22. Lived at 17 Mount Pleasant Street, Burnley, Lancashire. 26th September 1915, aged 26. Son of William Alexander, "Gowanlea", Carstairs Junction, Lanarkshire, Scotland. Son of James Allan, of 9, Callon St., Airdrie, Lanarkshire. 13th October 1915, aged 19. Son of Mr. and Mrs. Percy G. Allday, of 150, Hagley Rd., Edgbaston, Birmingham. 25th September 1915, aged 33. Son of Leslie M. and Jeanie Amelia Balfour-Melville, of New Club, Edinburgh. 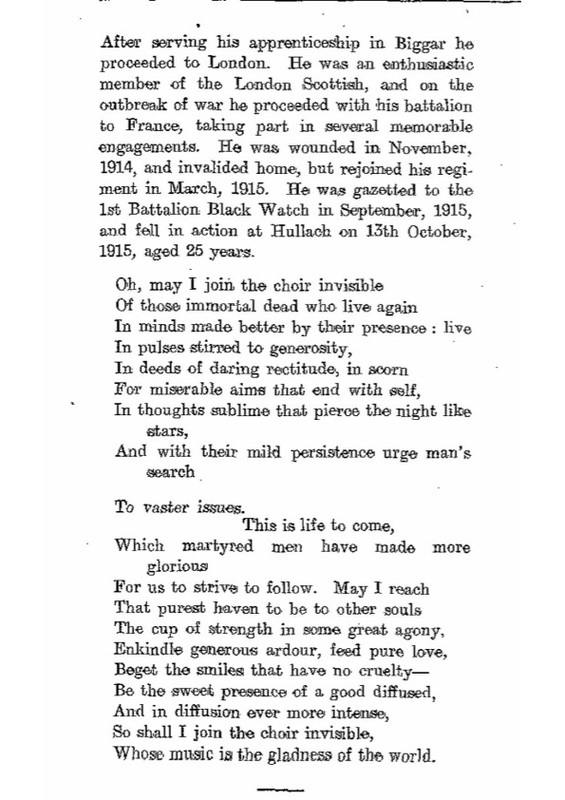 13th October 1915, aged 25. After serving an apprenticeship (I don't know what) in Biggar, Lanarkshire, he went to London as a travelling salesman. In the 1911 census he was living as a lodger at 86 Grove Lane, Camberwell, London SE, and working as a 'Draper's Assistant'. William joined the 14th Bn London Scottish Regiment as Private 1455 prior to the outbreak of WW1. He went to France on 15 Sep 1914, was wounded in November 1914, and was invalided back home. He rejoined his regiment in France in March 1915, and on 18 Sep 1915 was gazetted to the 1st Bn Black Watch, and was commissioned as 2nd Lt. He fell in action at Hulluch, France, during the Battle of Loos. He was 25 years old. His remains were never recovered and he is commemorated on Panels 78 to 83 at Loos Memorial, France. Born 6 Feb 1890, at Drochil Cottages, Newlands, Peeblesshire. Son of John and Christina Ballantyne. 2nd October 1915, aged 37. Husband of Annie Bell, of 89, Hawkstone St., Dingle, Liverpool. 25th September 1915, aged 21. Son of Alice Ann Bickle, of 14, Whittam St., Burnley, and the late John Bickle. 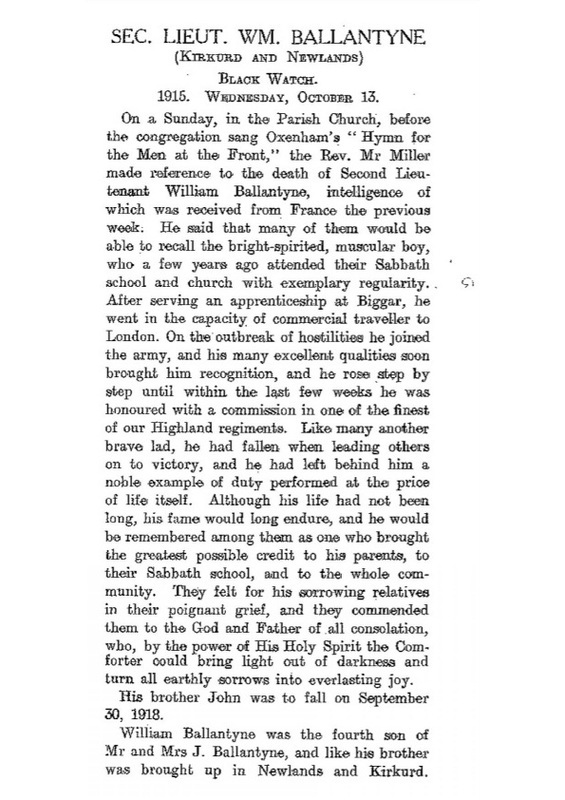 His father fell at the Dardanelles. Previously lived at 34 Calder Vale Road, Burnley. Son of James and Ann Bullen, of 134, Every St., Burnley. 25th September 1915, aged 23. Son of Mrs Burrows, 70 Railway Street, Nelson, Lancashire. Prior to enlisting in November 1914, he worked as a doubler in the employ of Messrs. J. Nelson & Co.
Fred was killed in the attack on 25th September, 1915, along with another Nelson lad, Rennie Higson. 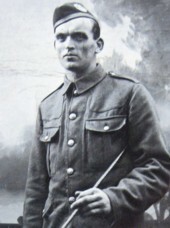 Private Higson's cousin, William Wilton, who also served, wrote that both Fred and Rennie had been killed and were buried together, neither man's remains were identified after the war. 25th September 1915, aged 30. Son of Walter and Mary Alice Butterworth, of 39, Seed St., Blackpool. David enlisted in Burnley and prior to this was a butcher in Blackburn. 25th September 1915, aged 24. Husband of Mrs Button, 114 Gordon Street, Burnley. Prior to enlisting, Austin was a weaver at Messrs. Preston's, Burnley Lane, Shed. Last reported as "Wounded and Missing."